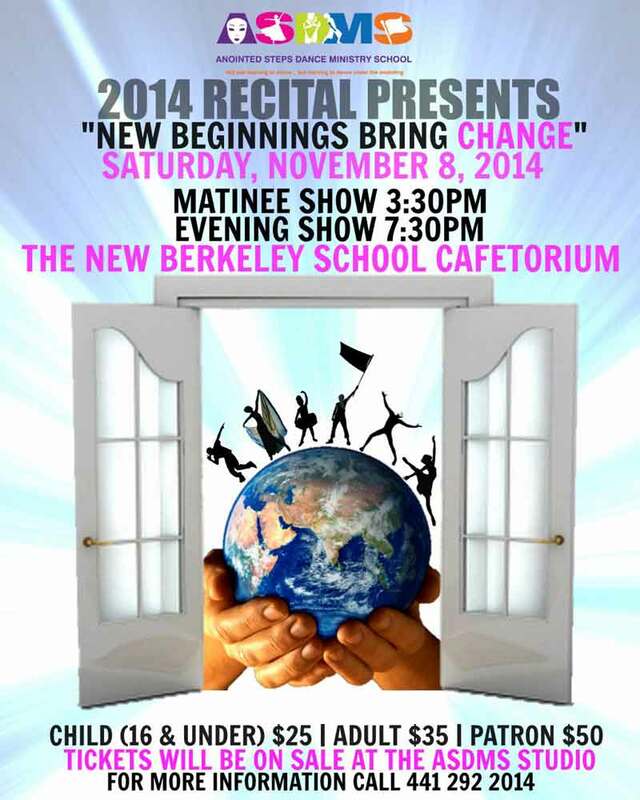 Anointed Steps Dance Ministry School is going to host their first Annual School Recital at The New Berkeley School Cafetorium on November 8, 2014. They will be hosting two shows, with a Matinee at 3:30pm and an Evening Show at 7:30pm. Tickets can be purchased from any ASDMS Student or ASDMS Teacher, tickets can also be purchase directly from the school from Monday to Thursday from 6pm until 7pm, and tickets can also be purchased at the door. The cost of the tickets are $25 for children 16 years and under, $35 for Adults and $50 for Patrons. A spokesperson said, “Greetings! Well Anointed Steps Dance Ministry School is now six months old! Hallelujah! God has been so faithful! “I want to stop and take a moment to say a sincere thank you to the current family members of ASDMS, the vision that God placed inside of me could not have been possible without you! I am forever grateful to you for trusting the God in me, and for walking into our doors. This could not be possible without you. “The teachers have worked hard with the students, and now we will get the opportunity to share their talents with the Public. “As we get ready to end our final term for the school year, we look forward to welcoming new faces to the school. Registration for our new term in January 2015 will be begin on December 15, 2014. “My prayer is that every student that walks into the doors of ASMDS will have a life changing experience! Remembering always that they do not have to compromise their dance, the gift that God has given them. “I am also excited to add that the Recital attire that you will witness our students wearing was made by Deborah Prince owner of Royalty Unlimited.